This album recollects and celebrates some of the choral music heard on royal occasions during the lifetime of HM Elizabeth II. The music chosen reflects the personal choices and commissions by the Royal Family for weddings, funerals, and anniversaries. 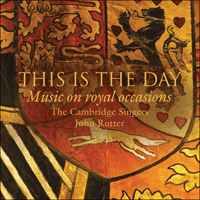 Featuring John Rutter’s celebratory royal wedding anthem This is the day, written for the marriage of Prince William and Kate Middleton at Westminster Abbey in 2011. Orchestrated specially for this recording, it reminds us of an event that captivated the attention of the nation. The album also includes an arrangement for unaccompanied choir of the much-loved Air from County Derry to the text I would be true, and an orchestration of Schubert’s beautiful Psalm 23—The Lord is my Shepherd by John Rutter for this recording. Unforgettably sung at the wedding of Prince Andrew and Sarah Ferguson by Arleen Augér only seven years before her untimely death, this ravishing aria is the fifth of the seven movements comprising Mozart’s Vesperae solennes de confessore of 1780, one of the last of his Salzburg church compositions written before the move to freelance life in Vienna the following year ended his contractual obligation to write sacred music. Operatic influence is clearly to the fore, a sign of the direction Mozart’s life was to take in the final decade of his life. Schubert composed this setting—originally not of the text in English, as heard here, but of Moses Mendelssohn’s German version of the renowned psalm—in 1820. It was written for a soirée given in Vienna by four musical sisters, the Fröhlichs, one of whom was a singing teacher. The piece quickly became a favourite and (unusually with Schubert) was soon published. The piano accompaniment, which bears traces of an imagined orchestral version, was orchestrated for this recording. This is the fourth of the seven movements of Brahms’s Ein deutsches Requiem (1868). Its fluently melodious, gracious style, reminiscent of the composer’s Liebeslieder waltzes, established it as a favourite in its own right, and in English translation it soon found a place in the Anglican anthem repertoire. This solemn, impressive chorus, expansive and symphonic in scale, forms the prologue to Elgar’s oratorio The Apostles (1903), which was written three years after The Dream of Gerontius and intended to be the first part of a trilogy (only two-thirds completed, in the event) on the theme of the early history of the Christian church. As with Brahms’s How lovely is thy dwelling place, the enterprising publishing firm of Novello made a successful Anglican anthem out of an extract from a larger work, in this case skilfully reducing Elgar’s highly idiomatic orchestral writing for organ. Sir William McKie was a key figure in the musical history of royal occasions in Britain. Born in Australia, he came to London to study at the Royal College of Music and later went to Oxford as organ scholar of Worcester College. Following a period of teaching at Clifton College and a temporary return to Melbourne in 1930, he was appointed organist of Westminster Abbey in 1941, a post he held until 1963. During his tenure he directed the music for the wedding of Princess Elizabeth and Prince Philip in 1947, the coronation in 1953, and the wedding of Princess Margaret and Anthony Armstrong-Jones in 1960. We wait for thy loving kindness is one of only a handful of his published compositions and was written in 1947 for the first of these occasions in a richly romantic style not unlike that of his organist-composer contemporaries Harris and Bairstow. The opening organ intonation carries a hint of the Gregorian chant Veni Creator Spiritus, seeming to invoke the blessing of the Holy Spirit upon the royal couple. The inclusion of this unaccompanied motet in the 2011 royal wedding by special request brought Welsh composer Paul Mealor to international prominence. His compositional background is solidly academic: early studies with Nicola LeFanu and with Hans Abrahamsen in Denmark have led him to find an individual voice heard in a growing and diverse catalogue of work, which he has combined with a professorship of composition at the University of Aberdeen. Ubi caritas, a specially reworked version of his secular choral piece Now sleeps the crimson petal, shares something of the mystical atmosphere and harmonic techniques of the music of Morten Lauridsen and Eric Whitacre while remaining distinctively his own. In the closing bars a quotation of the Gregorian chant used in Duruflé’s setting of the text [see track 8] creates an appropriate historical resonance. For most of his career Duruflé was organist at the church of St Etienne-du-Mont in Paris and a professor at the Conservatoire. His body of published compositions, the Requiem of 1947 foremost among them, is slender but highly valued among musicians for its impeccable craftsmanship and affectionately individual absorption of Gregorian chant, an influence dating from his early years at Rouen Cathedral. Ubi caritas (1960) is the first of a set of four short motets ‘based on Gregorian themes’, in this case the one used as an antiphon at the ceremony of the washing of the feet on Maundy Thursday. Harris’s life was filled with royal connections, as organist at the chapel of St George’s Windsor from 1933 to 1961 and as piano teacher to the young princesses Elizabeth and Margaret. Holy is the true light was composed around 1947 in memory of Evelyn Ley, the wife of his friend and colleague Henry Ley, Precentor of Eton College. The text was very possibly drawn to his attention by Herbert Howells, who had recently set it in the final movement of his Hymnus Paradisi. Harris’s setting is far simpler, though it shares a similar sense of rapt mysticism and has an atmospheric beauty which made it an apt choice for inclusion in the Queen Mother’s funeral service (which she herself had planned in meticulous detail). This moving elegy, written in memory of a young girl killed in a road accident in 1993 and so memorably performed at the close of Princess Diana’s funeral service in 1997, was one of the fruits of John Tavener’s interest in the music and rituals of the Greek Orthodox Church. Underpinned throughout by a sustained low bass note, the chant-like music alternates between expressions of blessing, grief, and the ultimate promise of resurrection. Choral music has formed a valuable strand in the wide-ranging output of Sir Richard Rodney Bennett, and his skill in handling the choral medium as well as his love of words made him an imaginative choice for a commission from the Dean and Chapter of Westminster Abbey to mark the Diamond Wedding of of HM The Queen and Prince Philip. These three, first performed at a special service to mark the anniversary in November 2007, captures the rhetorical grandeur of St Paul’s text without unnecessary overstatement, melting into a restrained tenderness at the final appearance of the word ‘love’. Walton’s musical life began as a chorister at Christ Church Oxford, and from time to time he returned to choral music, generally in response to a specific invitation or commission. Set me as a seal upon thine heart was composed in 1938 for the wedding of Ivor Guest (son of Lady Alice Wimborne, with whom Walton was close at the time) and Lady Mabel Fox-Strangways. Within its brief time-span, Walton’s setting of these aptly-chosen lines from the Song of Songs bears recognizable hallmarks of his style—intensity of mood, bitter-sweetness of harmony, and a certain melodic angularity which precludes any hint of sentimentality. Prominent in his own day as organist at the Temple Church in London and as a composer and lecturer, Walford Davies is now remembered for just three of his many compositions: the RAF March (he was its musical director), the Solemn Melody, and God be in my head which he wrote in 1910, a simple and well-loved setting of one of the earliest English prayers. The Irish folk-melody set to these words is of mysterious origin and first appeared in print in 1855 in The Ancient Music of Ireland, a collection edited by George Petrie who stated that it had been noted down by a Miss Lucy Ross—presumably from the playing of a fiddler or piper, as it is wordless. The exceptional beauty of the melody led to many arrangements being made, including several by Percy Grainger; words were written by Fred Weatherley, and the Air became Danny Boy. In the sacred sphere, I would be true is one of several hymn texts which have been wedded to the tune over the years. The text author, Howard Walter, was an American missionary who wrote I would be true in 1906 under the title ‘My Creed’. Princess Diana’s fondness for the melody prompted its inclusion in her funeral service. The present arrangement for unaccompanied choir was made specially for this recording. After the death of Elgar in 1934, Walton was acknowledged as the living English composer best able to capture the essence of royal pageantry in music. He was called into service at both the 1937 and 1953 coronations, writing Crown Imperial for King George and Orb and Sceptre and the Coronation Te Deum for Queen Elizabeth. He was also responsible for the music of three ‘royal’ Shakespeare films with Laurence Olivier, of which Henry V (1944) was the first and most successful. Touch her soft lips and part is a string-orchestra miniature of exquisite tenderness, heard in the film after the death of Falstaff as Pistol and his companions bid farewell to Mistress Quickly on the eve of their departure for France. It was played as part of the introductory music before the 2011 royal wedding, and serves in this recording as a wordless interlude between the mood of reflection preceding it and the rejoicing which follows. In 1952 Britten, in collaboration with his then favoured librettist William Plomer, conceived the idea of a ‘national’ opera to mark the dawn of the new Elizabethan age; Elizabeth I was settled upon as the central figure, her relationship with the Earl of Essex providing the mainspring of the drama, and the music was swiftly written. With royal approval, Gloriana was made a semi-official part of the 1953 coronation festivities and premièred at Covent Garden just four days after the coronation, but it seems not to have been a success (though accounts differ) and revivals have been few. In 1954 Britten did successfully extract the six choral dances which are heard at the start of Act II as the Queen is welcomed by the people of Norwich with a pageant of ‘Time and Concord’. Only minimal editing was needed to turn this episode from the opera into the present attractive suite for unaccompanied choir, which has firmly remained in the repertoire and is perhaps Gloriana’s most lasting legacy. 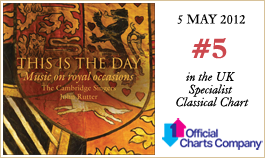 This album recollects, and celebrates, some of the choral music heard on royal occasions in England during the lifetime of HM Queen Elizabeth II. The main focus is not on the pomp and pageantry of coronations, but rather on the more personal family events of weddings and funerals where music plays a different role, less ceremonial and more reflective of a wide range of private emotions, often being chosen by those most closely involved. Ten royal occasions [listed chronologically below] are represented, and the programme—a personal and partial selection, inevitably—is rounded out with Benjamin Britten’s Choral Dances from Gloriana, the opera he conceived as a loyal tribute in Queen Elizabeth’s coronation year.